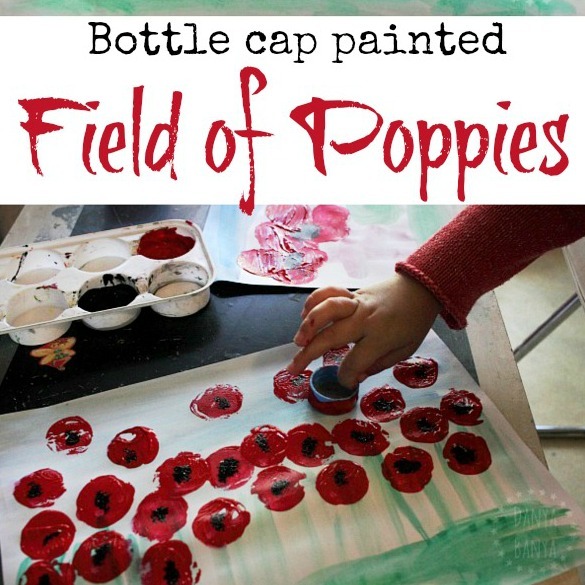 Field of red poppies art idea to help kids commemorate Anzac Day and Remembrance Day. 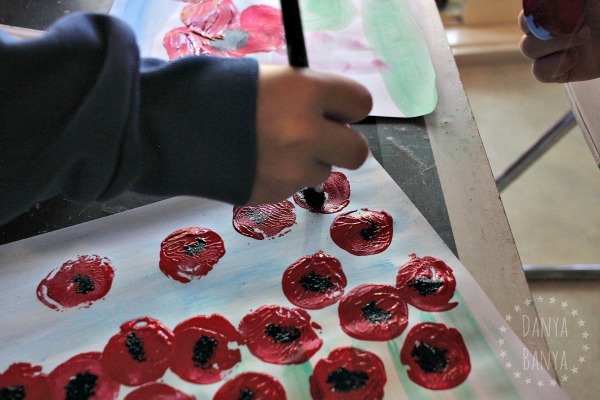 War is a tricky subject to broach with little kids, but teaching kids about the symbols of remembrance is a good starting point. The red poppy flower, or a field of red poppies, is one of those symbols. 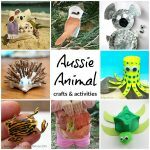 In Australia we observe Anzac Day on 25th April and Remembrance Day on 11th November (which is Veteran’s Day in the US). 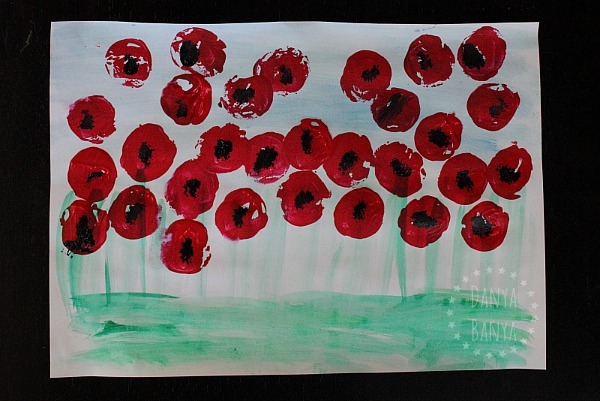 Last Anzac Day we made these poppy paintings as a way to help our kids learn about, and commemorate, our fallen heroes. JJ (5.5 years old), Bee (3.5 years old) and I worked alongside each other, working on our projects partly individually, partly collaborating, as is usual in our household. We started by painting a blue and green background layer using watercolours. We use a watercolour wheel stack like this one (<– aff link*). I find watercolours are great for painting backgrounds as they are quick to dry, and provide a subtle pastel background image which makes any bright colours we add later to really stand out. We painted two sets, because JJ and I had different ideas that we wanted to try. 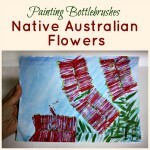 Related: You may recognise this watercolour background technique from when we did our Aussie bottlebrush paintings. Once the watercolours were dry (which only took a minute), we moved onto the next layer, using brighter acrylic paints. 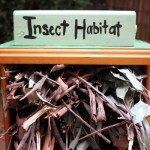 The acrylic we use look similar to these (<– aff link*). 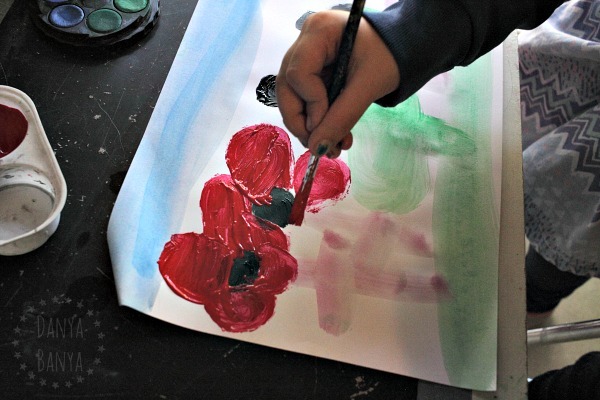 JJ wanted to try painting poppies with a paintbrush. 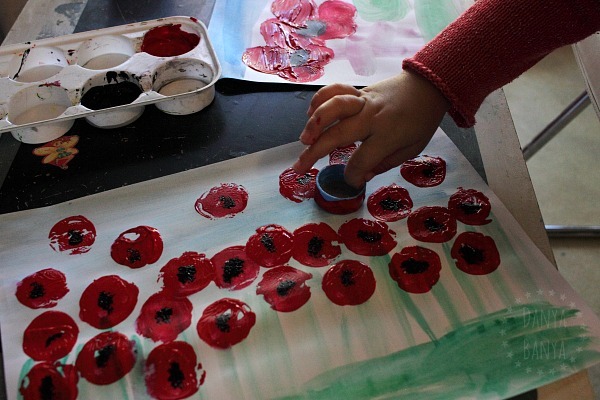 She painted the black centres first, washed her brush, and then painted red petals around the outside. The first few poppies looked great, but with the next few she had difficulty preventing the black paint from mixing with the red. We talked about how she could have waited until the black paint was dry before adding the red layer. 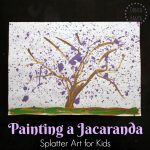 (We’ve been learning about layering paintings to achieve particular results and prevent others, and so this was a great way for her to see this for herself). 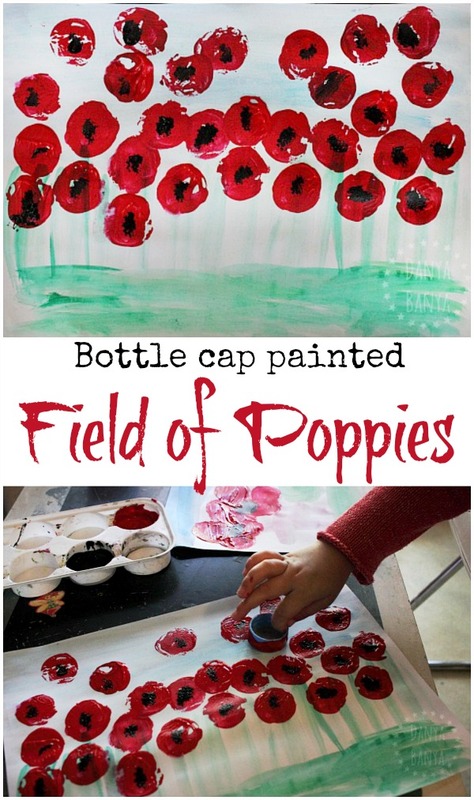 We dotted the middle of the poppies using a thick paint brush with a splodge of black paint on the tip. We talked about how we didn’t have to wait for the red to dry, partly because black is a darker colour than red, and partly because we were stamping the black paint on with one motion, so it wouldn’t smear. 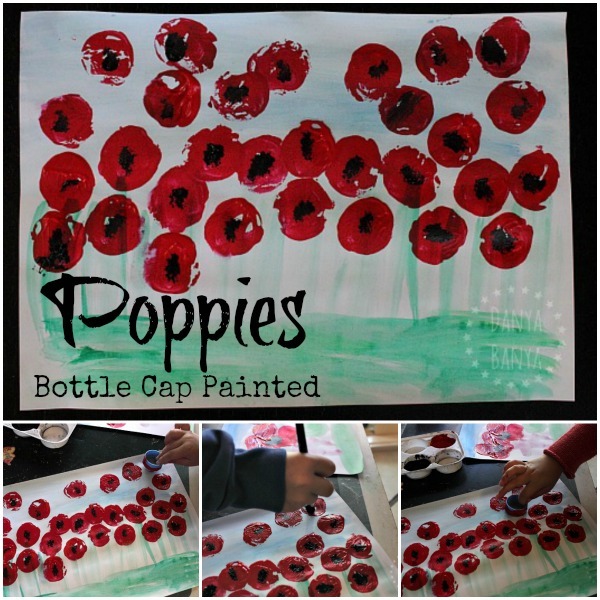 We talked about how we could paint poppies all over the top, without necessarily matching up each green stem, to give an impression of a field of poppies. 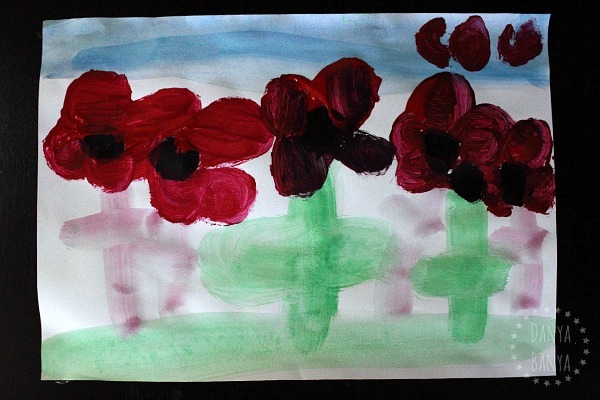 JJ helped paint some poppies too. All the while we talked about how poppies are a symbol of war veterans, and how the girls’ great-grandfathers had fought for Australia when they were young, and how the girls’ great-grandmother had served as a nurse in the war when she was young too. 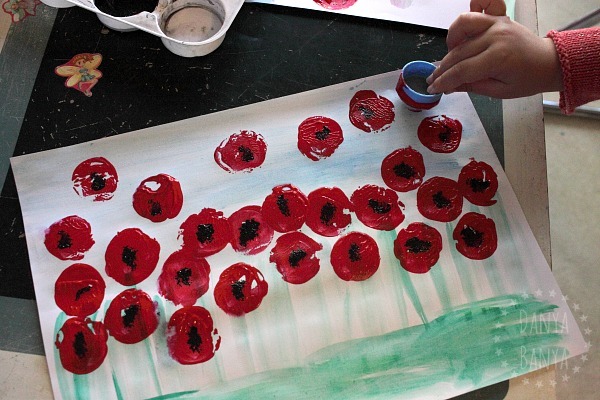 Sadly, since creating these poppy paintings, that great-grandmother passed, at 99 years old. JJ and Bee were given a red poppy each to pin to their dresses at her funeral. 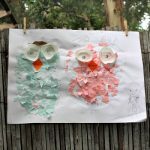 Paper plate poppies from Laughing Kids Learn. Coffee filter poppies from Happy Hooligans. Or this beautiful yarn poppy, also from Happy Hooligans.